Out of energy? Eat less while still being able to get through the day. Find out how you can lose weight and keep fat off your back with more balanced meals and a smarter diet. 5 meals a day... This probably isn't something you are use to hearing. For many of us, going on a diet usually means decreasing the number of meals we eat every day, or reducing the amount we eat in one sitting. In this case, we are constantly fighting our hunger trying keep calorie intake to a minimum. However, the diet we are going to be introducing in this column allows you to eat more often and slim down at the same time. So, why is it that by eating more often that you don't gain weight? Whether you lose or gain weight depends solely on how well you are able to balance your calorie intake with the amount your burn every day, calorie consumption. For example, consider a diet in which you burn 2000 calories per day. In this case, as long as you take in at least 2000 calories through the food you eat, you should be fine. That is that as long as you can maintain the balance between calorie intake and consumption, it shouldn't matter how many times you eat allowing you to still lose weight. How does eating more meals per day affect the amount you eat (calorie intake) per sitting? Eating the way you usually do when adding more meals to your day would be considered over eating. That is why it is necessary to reduce your calorie intake per meal. Note that even though you are eating less per sitting, the amount you eat throughout the day should remain the same. Hence, in exchange for decrease the amount you eat per sitting, the amount of times you should eat increases resultantly. As shown above, by distributing meals throughout the day, you are less likely to end up with an empty stomach. Note that the way you go about your day and the amount of exercise you get varies from person to person. In that respect, so should the amount of meals you eat and daily calorie intake. That is why when choosing to go along with this diet, it's important that you figure out what is right for you, not just following what is given to you in a table. By eating more meals each day you are less likely to gain weight! Increasing the number of meals you eat each day helps in nutrient absorption eliminating amount of time your body spends running on low nutrient levels. With elongated periods of time between meals, it's hard not to get the feeling of an empty stomach every once in a while. In the mean time, the amount of energy your body has in store begins to dwindle. When you skip a meal, the body recognizes this as a lack of energy and begins to take preventative measures in your next meal, storing energy away for the next time this happens. However, one the other hand when you spend less time between meals, supplying energy more frequently, the body sees this as having more than enough energy. 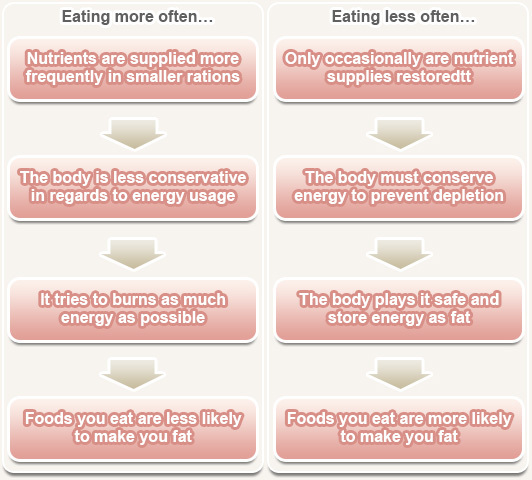 With a shorter nutrient supply time period, the body can go without storing energy into fat. In turn what you get out of it is that the nutrients and energy you absorb become readily available and more likely to be used by your body, making you less prone to storing away fat. Using the same principle, a sumo wrestler eats only 2 meals a day. The reason for this is that it makes it easier to store energy away as fat. That is why you would expect eating more frequently to have the opposite effect, making it easier to avoid gaining weight. The time you eat is just as important as the amount of times you eat! Although by increasing the amount of times you eat it's harder to get fat, this doesn't mean you can eat any time you want. Actually you can, but you have to be consistent. Mind the time you eat. For just about anybody, it's common sense nowadays that eating late at night can make you fat. 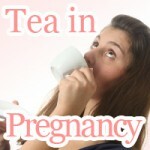 One reason for this is that during this time your body is more likely to store energy away. Unfortunately, this is not the only reason why eating late at night can make you fat. As your biological clock approaches the evening hours of your day BMAL-1, a protein in the body that is thought to cause us to store and accumulate fat, levels are highest. As a result, you are more likely to put on fat and gain weight by eating late at night than earlier in the day. You now see why just by eating more meals per day is not going to work and why it's just important to watch what time you eat to prevent unnecessary storage of fat. What is BMAL-1 and how affects your diet? Inside the body there is a protein that recent research has shown to be connected to how your body stores and accumulates fat. When BMAL-1 levels in your body are highest (between 10PM -2AM) or lowest (about 3PM), the way your body processes incoming calories differs greatly in regards to fat storage activity. That is why depending on your bodies BMAL-1 levels, energy is more likely to be burned away or stored as fat. 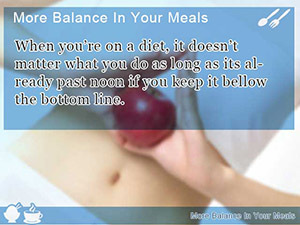 Knowing how timing effects the way your body processes calorie intake helps you better decide how to balance your meals. 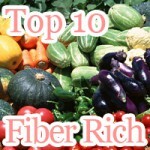 Therefore, it may be attractive to plan to eat more during the hours before dinner, because BMAl-1 levels are lower. Meat eating protein diets don’t have to take the excitement out of your meals. 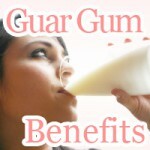 With the flexibility of the all protein diet you can lose weight easily. 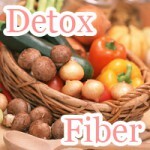 Eat low calorie meals on the okayu diet reducing calories every meal without giving up on eating. Japanese rice porridge for healthy weight loss that works. Are you eating cheese in your diet? How it stands is that going on the cheese diet plan to lose weight may be your best chance to get slim without giving up on your love for food. Who said you couldn’t eat without gaining weight? They’re full of air like a balloon. Just chew your food and eat before it gets dark out. That’s all it takes. Put a stop to unwanted binge eating set out to ruin your diet on the chocolate diet for everyone not just raging chocoholics. Simple diet plan for appetite control. 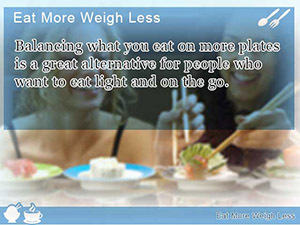 Balancing what you eat on more plates is a great alternative for people who want to eat light and on the go. When you're on a diet, it doesn't matter what you do as long as its already past noon if you keep it bellow the bottom line. 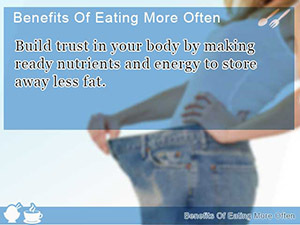 Build trust in your body by making ready nutrients and energy to store away less fat.